maa Durga is a divine female god of Hindu deities. She is most worshipped goddess in Hindu religion. Hindu deities referred her as “Maa Durga”. Goddess Durga is known for killing Mahishasur. Mahishasur was demon who disturbed humanity on this earth. Through intense worshipped of lord Brahma, Mahishasura got the boon that he could not be defeated by any man or god. He defeated lots of gods from heaven to earth and ruined this world. All gods did prayer to lord Brahma to save their lives and this world from demon Mahishasur and his threat. Also gods were panic to fight with Mahishasur and his army. 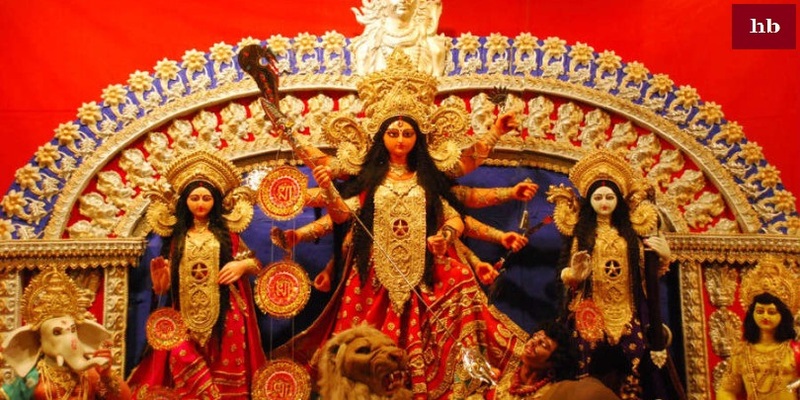 When goddess Durga and Mahishasur were fighting, Mahishasura underestimated goddess durga, and said: "A female can never kill me" hearing this, goddess Durga roared with laughter on him, that caused there were flood and earthquake surrounded on earth that created Mahishasur alert to the powers of Maa Durga. And finally goddess Durga killed Mahishasur with her sword. Meanwhile fighting with Maa Durga, Mahishasur changes his original form from demon to buffalo. Goddess Durga finally cut demo’s head with her sword and killed him and free this earth from his victimization. This fight gone to ten days with Mahishashur and defeated demon Mahishasur. These ten days known as "Vijayadashami" in Hindu religion and celebrated as Durga pooja just before Dussehra. 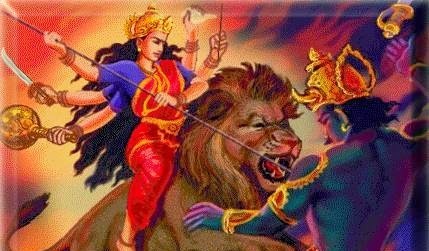 How goddess Durga defeated demon Mahishasur that teaches us to win over darkness and ruined egoism of someone. Goddess Durga puts great energy into our soul that is her protecting style and motivated this world. Her effulgent knowledge dispels the darkness inside us. Like lord Shiva Maa Durga images also has 3 eyes to represent this universe her left eye (moon) represents divine love, her right eye (sun) represents transformative action and her central eye (fire) represents knowledge, the 3 aspects of the universe. 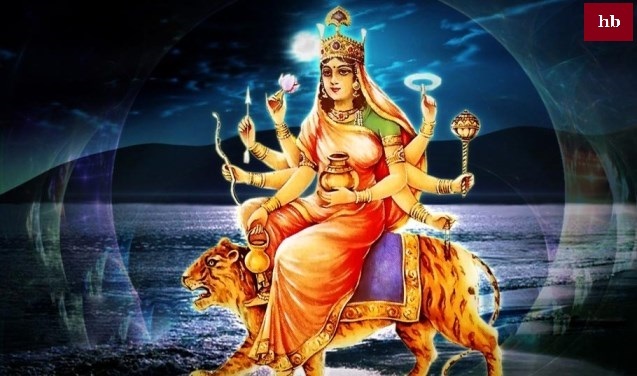 With these three eyes we call her "Triyambake" that means three eyes.If we talk about Ma Durga's savaari(vehicle), she uses lion as he vehicle. Lion represents the power of Ma Durga and bright.Maa Durga story and her braveness removes the dark curtain from our life and Hindu deity (desire), krodh (anger), nasha (intoxication), moh (delusion), lobh (greed), ahankaar (ego) and jalan (jealousy). The creation or Birth of goddess maa durga was the combination power of all the gods. That is why maa durga is the most powerful spiritual being within this universe. If we talk about maa durga looks and appearance she has ten hands, her vehicle is lion, a trident (trishul) is in her hand. Ma Durga well blessed from all Lord Brahma, Lord Vishnu and lord Shiva. All these three gods gave their supreme power to ma Durga to fight with demon and save this universe from darkness. Ma Durga is most popular female god in the Hindu religion. She worships with different style from her devotees from all over the world. Mahishasur demon was trying to demean her many times but ma durga never lost her motive and target she fought bravely with that demon and finally killed him and destroyed his proud. Maa Durga Story is very famous. As we knew that ma Durga is a famous and most worshipped female god in hindu religion so there are lacs and crores of her deities around the world. They worship maa durga with their own style and use different process and way to worship her. Ma Durga is a creation of lord Vishnu images, lord Brahma and Lord Shiva wallpapers so she has most powerful female god. There is no any country around the which not have ma Durga’s temples. There are numbers of festivals dedicated to maa Durga in Hinduism.Durga puja of Navami is most popular festival dedicated to maa Durga. It is believed that on Navami goddess killed Mahishasur, the king of al demon.This festival is celebrated at huge level around the country and also around the world as Durga Pooja . This festival is continuously celebrated in 9 days. All Hindus cleanup their houses do whitewash all around to their houses. They do maa durga path at their homes and different types of pooja.At the evening time peoples do aarti of goddess durga at huge level. In Hinduism we called her Maa. We call her Maa Durga images with huge respect. 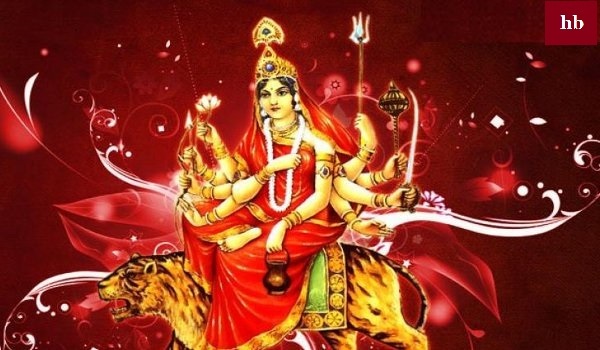 Maa durga also known as Chandi, Shailputri, Brahmacharini, Shakti, Maa Shera Wali and many more manes for maa durga.Durga pooja is celebrated at very huge level in Kolkata in bangle style and this pooja of Kolkata is widely famous. Peoples take holiday from their jobs, works, offices and schools. Peoples make idols of maa durga at every place and decorate these maa durga’s idols with excitement and devotion. After 9 days celebration and pooja of maa durga, these idols finally flow in some holy rivers. This is the end of Navami or Durga pooja. This avatar of goddess Durga is known as Sati, maa Bhavani, Shakti maa Parvati and Hemavati. 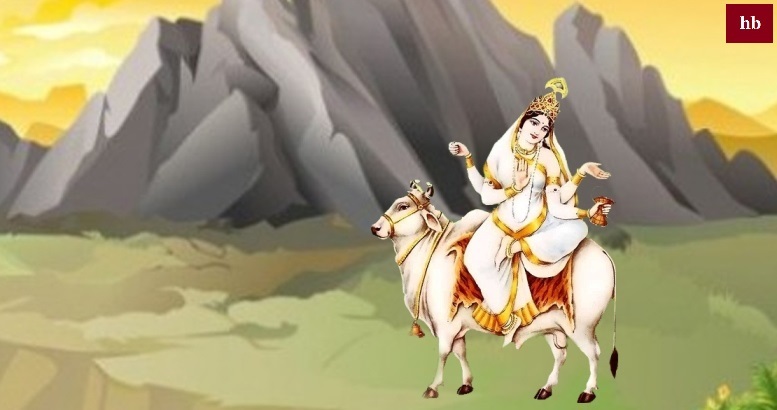 Maa Shailputri is the daughter of the Himalayas(mountain himalaya) and the better half of Lord Shiva. 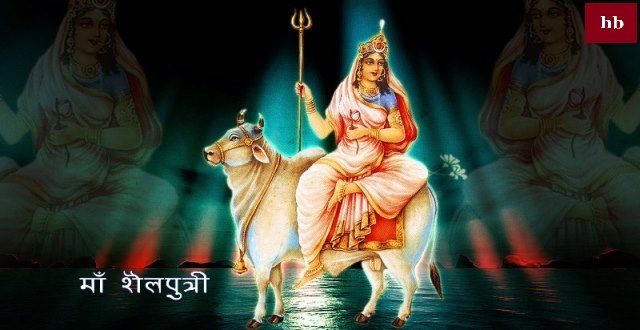 With a trishul(trident) in one hand, and a lotus flower in the other hand also maa Shailputri has Nandi the bull as her vehicle to travel around the universe. 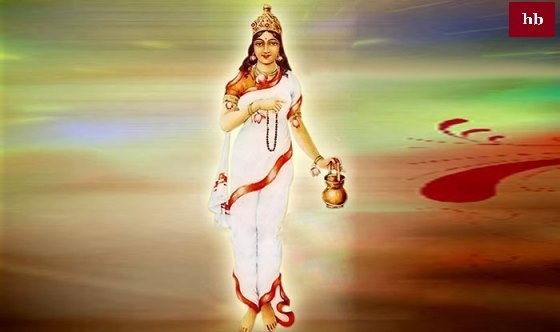 The second avatar of ma Durga is the Shakti Roop of ma Brahmacharini. This avatar of Maa Brahmacharini created from the word Brahma, this means – one who observes penance or tapa yog, and good deeds. Thus, she is the one who practices penance, yog, sadhana. It is said that the Veda, Tatva and Tapa are synonyms for Brahma. 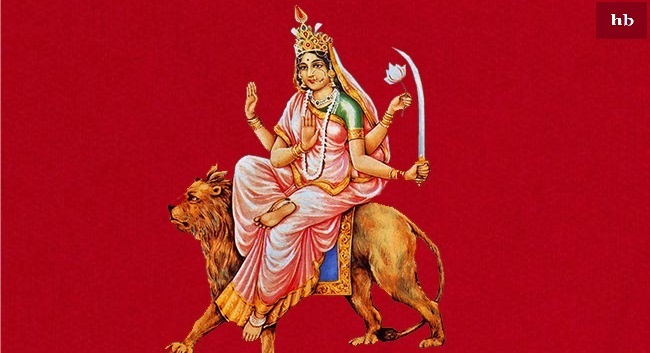 On the third day of navratri mata Durga appears as 'maa Sherawali' or also known as maa Chandraghanta. This avatar is a most popular avatar of maa Durga that is worshiped as Vaishno Devi at jammu place. This avatar of maa Durga as Ma Kushmanda is worshipped on the fourth day of Navrathri. She shines brightly with a smiley face in all ten directions as the Sun. She controls whole Solar system. In her eight hands, she holds several types of weapons in six hands and a rosary and a lotus in remaining hands. She rides on Lion. She likes offerings of "Kumhde", hence her name "Kushmanda" has become popular. Lord Kartikeya is the elder son of lord Shiva and ma Parvati is also known as lord Skanda. This is why maa Parvati also known as Skandamata. Her vehicle is a lion and has four arms. While she carries lotus in her upper two hands, she holds six-headed baby Kartikeya with one hand. She is the goddess of this universe. She sits on the lotus flower and that's the reason known as Goddess Padmasana. To kill evil Mahishasura, maa Parvati took the avatar of ma Katyayani. This avatar was the most dangerous form of ma Parvati. In this avatar ma Parvati is also known as Shakti the power of all women in this universe. Finally goddess killed that demon and removed the darkness from the world. Ma Kalratri is the seventh avatar of ma Durga. On the seventh day of Navratri we worship ma Kalratri. Ma Kalratri is the fieriest avatar of the ma Durga. The complexion of ma Kalratri is dark like deep night. She has long tresses which remain open and her necklace shines like thunder. Ma Kalratri has three eyes and fire comes out from her nostril when she breathes. On the eighth day of Navratri we worship the maa Durga as Maha Gauri. Maha Gauri has three eyes, four hands, and with fair complexion. It is believed that Ma Maha Gauri defeats all evil forces of the universe and also from our inner soul. 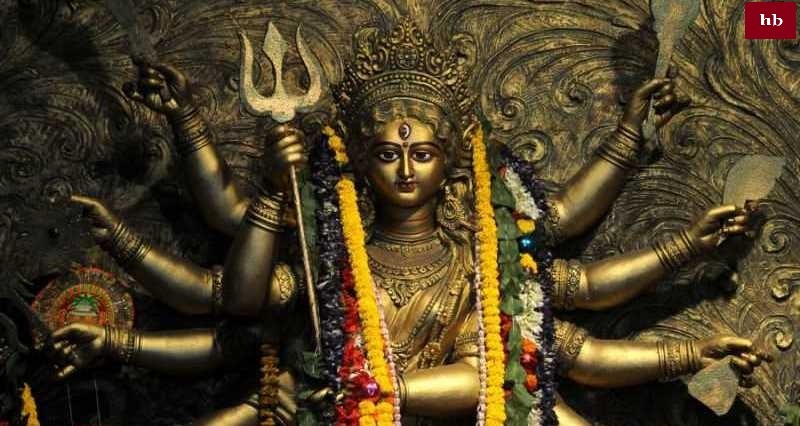 She holds a damru and a trident in her while the other two hands are held in postures of "abhay" and "varad" and blessing us with fearlessness and well-being. Lord Shiva is the creator of Maa Durga. As per story and we knew Mahishasur was a demon but he was a great devotee of Lord Brahma. After hard devotion of lord Brahma by demon Mahishasur he asked lord Brahma to give him a boon to be immortal. Although Lord Brahma satisfied with Mahishasur’s dedication for him but he cannot give Mahishasur a boon to be immortal it was totally against of universe. Lord Brahma finally said to demon that you cannot be defeated or killed by a man but a female can defeat or killed you. However, Mahishasur didn’t pay heed to Brahma’s warning as he believed that he had now possessed the power to defeat every man and God also and thinking how a woman can defeat him or killed him. And started to flow his darkness around the world. Started destroying the world and peoples of the universe. Mahishasur defeated many gods and killed many people around the world. Not only peoples even gods were started to fear from Mahishasur’s deeds.All gods reached to lord Brahma to save then and this world from demon Mahishahur and his army. Finally lord Brahma, lord Vishnu and lord Shiva created Ma Durga and gave all their power to kill Mahishasur. After nine days of battle with Mahishasur Maa Durga killed him. Maa Durga is the supreme of all female goddess and known as naari shakti. Maa Durga represents all the aspects of a perfect and powerful woman. 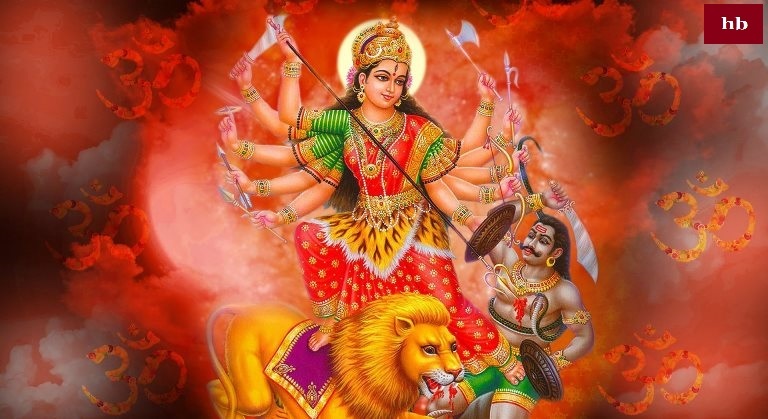 Her fight or battle with demon Mahishasur was continuously for 10 days and finally defeated that demon this story teach us a lot of things and bring brightness into our life. Maa Durga saved this universe and our lives. If we talk about Navaratri this is the celebration of the success of excellent over evil Mahishasur. This festival is celebrated all over world by Hindus at wide level. 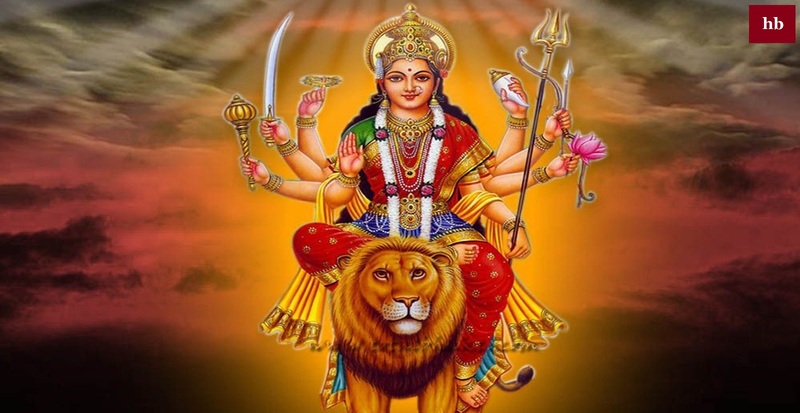 Durga means the power, the Sakti of women. Lord Brahma, lord Vishnu and lord Shiva all three given their all power to Maa Durga to show what is a female and a female can do anything and every things. Maa Durga known as the goddess of power and strength of all female gods. 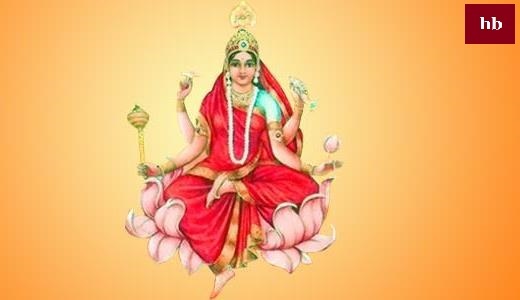 She is the most important worshipped goddess of the Hindus. She is a multi-dimensional Goddess, with hundreds of names, many more personas, and many aspects. She known as Mahishasuramardini or Shakti, she is the destroyer of all demons. Having a sword with her hand, with 10 mighty arms she killed the demon Mahishasura. As the born of Sati, daughter of the King Daksha and Queen Menaka she left the kingdom and earns her father's wrath. Born as maa Kali, she turns black as the night and almighty, terrible in rage and fury, with just a string of skulls as her garland and her only garb. Born as maa Parvati, she is serene, the pretty consort of Lord Shiva by his side in the snowy peaks of the Kailash mountain. She is Bhawani, symbol of life. She is Sati, the object of death. She is Basanti, the heralded of springtime. 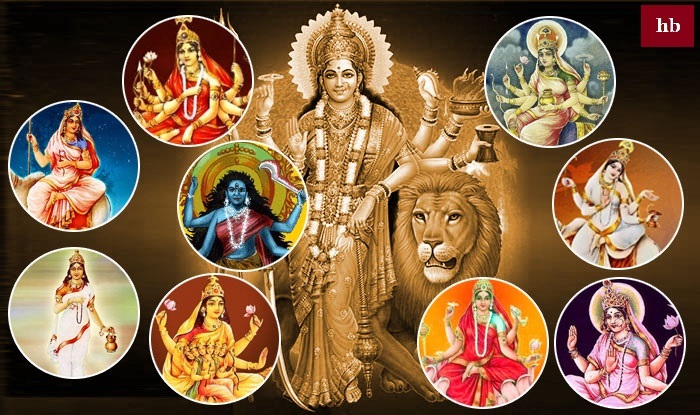 She is also Amba, Jagadhatri, Tara, Ambika, Annapurna and many more born by maa durga. Lord Indra, gave her a thunderbolt, and the gift of his white-skinned elephant, from Yama, maa durga received a sword and shield and from lord Vishwakarma (god of Architecture), an axe and armor, from the god of mountains, Himavat gifted her with jewels and a lion to ride on as vehicle for maa Durga. 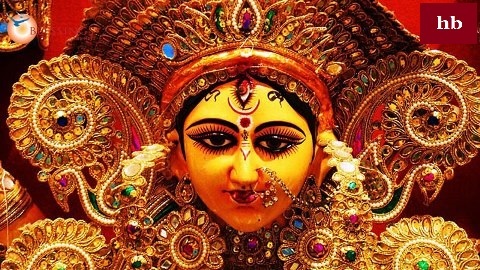 All gods also given maa Durga many other unique and magical gifts, all clothing to protect her, and a new type of garland with immortal lotuses for all over body.